Make the Gyro Meat: In a medium bowl, combine the ground lamb, salt, pepper and oregano leaves with your hands, mixing until all of the seasonings have been evenly distributed. Cover and refrigerate for at least 1 hour, or overnight. Preheat oven to 300 degrees F. Place the lamb mixture in the bowl of a food processor and add the onion, garlic and bacon. Process until a smooth puree is formed, 30 seconds to 1 minute, scraping down the sides of the bowl as necessary. Line a rimmed baking sheet with aluminum foil. With moistened hands, shape the lamb mixture into a rectangle about 4 inches long and 2 inches wide. Bake until the center of the loaf reaches 155 degrees F on an instant-read thermometer, 20 to 25 minutes. Remove from the oven and allow to rest for 15 minutes. I used skewers for the meat, as shown here. Serve your Gyros with warm bread either in the microwave (30 seconds), or in the oven. 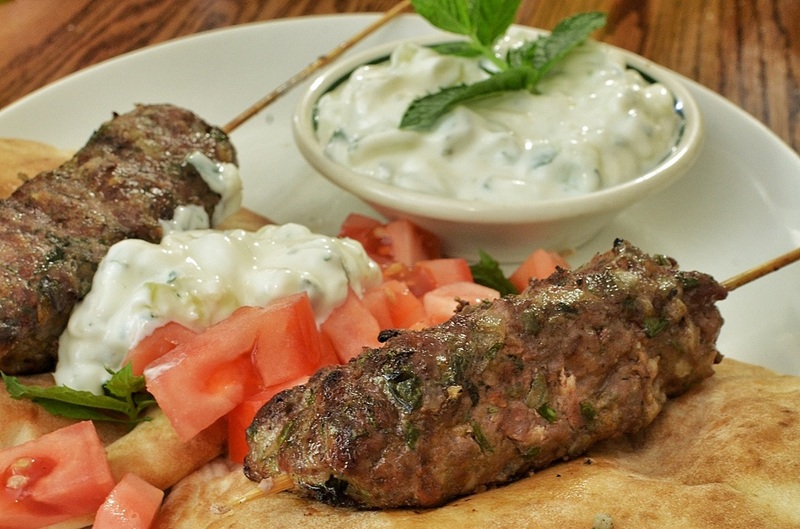 Top each with ¼ cup of tzatziki sauce, chopped tomatoes, sliced onions and gyro meat. Wrap with foil and serve.